Brian Froud is a contemporary English fantasy illustrator who has made studying myths about fairies and portraying fairies in illustration and for film his life’s work. Taking inspiration from the granite and peat laden landscapes of his Dartmoor homeland in southern England, he has created some of the most recognizable work depicting fantasy creators, utilizing acrylics, colored pencil, pastels and ink. 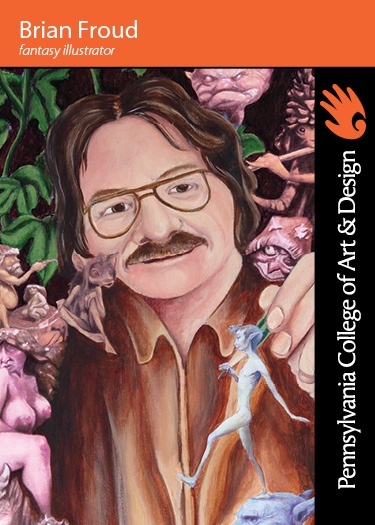 Brian Froud earned a degree in Graphic design from Maidstone College of Art in 1971 and spent his early career illustrating book jackets, advertising and children’s books. 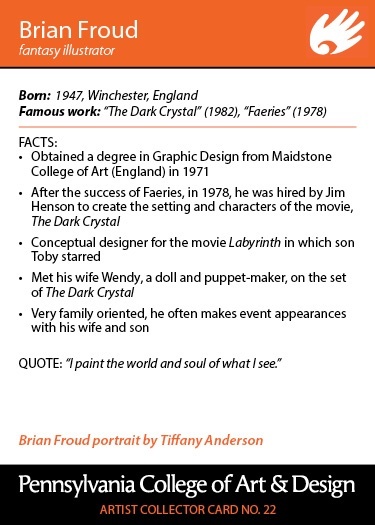 Froud collaborated with Jim Henson’s Creature Shop as a costume designer for the movies The Dark Crystal and Labyrinth. One of his art books, Faeries, produced with Alan Lee, was produced as an animated feature in 1981. He is the author and illustrator of bestselling books on fairies selling over 8 million copies, including Lady Cottington’s Pressed Fairy Book, Good Faeries/Bad Faeries and other titles. He has collaborated with other writers, including Ari Belek, John Matthews and his wife Wendy Froud, on fantasy books about goblins, trolls, giants and other creatures. Froud has been honored with a Hugo Award and a Chelsey Award, each given annually honoring the year’s best fantasy works. The depiction of creatures of the fantasy realm runs in the family. Foudlives and works in Devon with his wife, Wendy Froud, who is also a fantasy artist and celebrated dollmaker. His son Toby is a puppeteer and puppet fabricator.